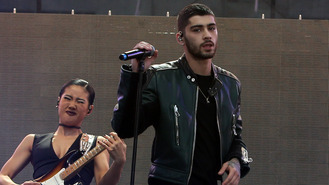 Zayn Malik is seeking to re-establish his friendship with Perrie Edwards, sources claim. The former One Direction star and the Little Mix singer got engaged in August 2013 but split two years later. Zayn has since been dating model Gigi Hadid, while Perrie has most recently been linked to McFly bassist Dougie Poynter, who she recently insisted to WENN she’s just friends with. Now, sources close to Pillowtalk singer Zayn reveal he is keen to be a part of Perrie's life in some form, even if he is with Gigi. The insider added that Perrie has unblocked her 23-year-old former beau's number and they are now exchanging messages. But apparently Zayn remains unsure whether he has left it too late to win back the blonde beauty's trust. "Zayn is freaking out," said the source, adding, "Especially as she has been linked to Dougie. He know he has no right to stand in the way of Perrie starting a new relationship, as it was him who ended it, but he does get really emotional and jealous when he see Perrie with other guys." And it seems that Zayn has a lot on his plate at the moment, causing him to suffer from anxiety, which meant he ended up cancelling his performance at the Capital FM Summertime Ball at London's Wembley Stadium last weekend (11Jun16). In a statement posted on social media, Zayn apologised for letting his fans down after they had patiently waited to see him perform, but promised to make it up to them. Among fans to share sympathetic messages with the star on Twitter was Gigi, 21, who praised him for his strength. "You made the best of the situation and have given your fans an opportunity to understand you better as a performer," she wrote, adding, "Love you and so proud of you always. xG." Rick Astley has scored his first number one album in nearly three decades. More than 1,500 family, friends and fans gathered at a chapel in New Jersey to pay tribute to Christina Grimmie. Rick Astley has topped the UK chart with his album '50'. Meat Loaf is "stable and in good condition" in hospital after collapsing on stage. Christina Aguilera is donating the proceeds from her new single to the Orlando shooting victims. Mariah Carey's estranged husband Nick Cannon has addressed the drama surrounding the couple's divorce in a new rap song. Nick Jonas has sent fans into a tailspin after fuelling romance rumours with Fifth Harmony singer Camila Cabello. Liam Payne is apparently focusing all of his attention on girlfriend Cheryl, and not his music. Jake Bugg has once again defended his decision to use co-writers on his debut LP.